Hey there, I’ve had some crafting friends ask me what products I like to use for different projects. I thought I’d take a few minutes and tell you that. I’ll break it down into different areas and today is CROCHET day. First things first. I’m naming particular brands because I personally like them. I’ve spent my own money or received them as gifts from friends and am being in no way compensated by the company to write anything about them. The links below marked with a * are affiliate links. Second things second, but not less important. This is what I like to use, if you don’t like it, oh well! We all have our personal preferences. Susan Bates Silvalume Crochet Hooks* Specifically, lately, the J-Hook. 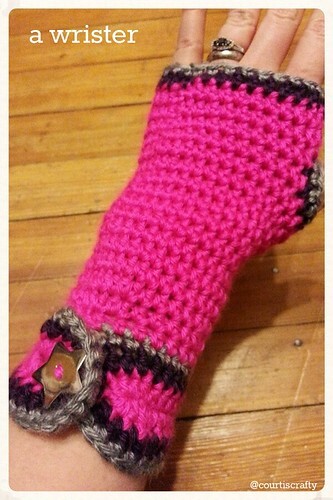 For most of my crochet work, the J-Hook is an invaluable tool. Don’t get me wrong, the H, the I, and N are good too. I basically never work in less than an H-Hook. I just don’t have the patience. Lion Brand Vanna’s Choice Yarn. I really do like this yarn a lot for many types of projects. The colors are awesome and plentiful, the yarn is soft but durable and it’s not wool. This girl can’t use wool yarn. It’s also heavy enough to be warm, but not ridiculous to work with for bigger projects. For home I’m a huge fan of the Fiskars 5-Inch Micro-tip Scissors * Mine are similar to those but have a different handle. They’re super sharp and excellent for any fabric or yarn trimming. For the road I’m a big fan of Fiskars Softgrip Kids Scissors . * They’re handy and I’m less likely to hurt myself with them in the car. They’re also excellent for paper projects while traveling. Gallon sized freezer bags. I’m not even kidding here crafters! This is a trick I learned from my G-d mother. If you have more than one project going on or you’re traveling about with your project, put it in a gallon sized freezer bag with the directions, the hook you’re using, and your yarn. It will help keep your project and yarn clean and you’re not left wondering which hook you might have been using. Not every J Hook is created equally! Actually, the H-Hook from my grandmother is slightly smaller than the ones made currently and in some projects you can see where you changed. Keep the hook with your project. Pinterest and Ravelry. I can’t tell you how much I love these two resources. I’m sure you’ve heard of them, but on the off chance you haven’t? Well, now you have. There are an endless list of places to get patterns for projects but these two are my go to for inspiration and patterns. Those are some of mine, what are some of yours? This entry was posted in crochet and tagged at home, Crochet, hooks, my current favorites, on the road, patterns, scissors, wrister, yarn. Bookmark the permalink.